Once in a while, you come across a fashion brand which is changing the world... Two Neighbors is doing just that! Their tagline is "Peace-Through the Eye of a Needle." Two Neighbors recently launched a gorgeous handbag collection that is grass roots join venture between Palestinian and Israeli women. The products are just beautiful. I am particularly fond of the Adeem tote bag (named after one of their Palestinian workers) - this red leather bag can hold everything but the kitchen sink and has an incredible hand woven embroidered shoulder strap. 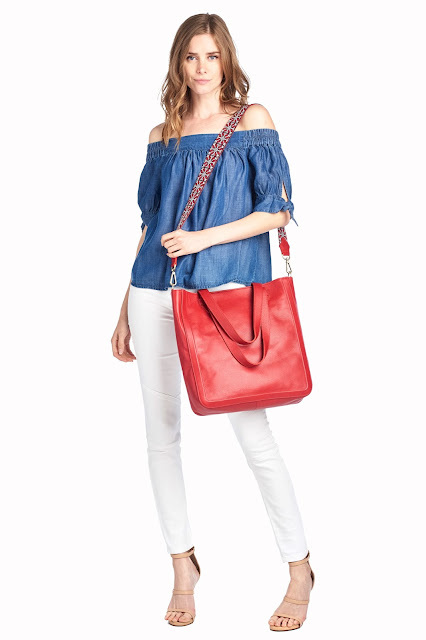 I just ordered this bag in red! Can't wait to use it! From their website: www.twoneighbors.com Meet Adeem. The "Adeem" carryall tote bag is perfect for your everyday work bag. Its open style fits a laptop and your work files. Gorgeous stitching and details make this bag an ideal addition to your handbag collection.